Michael has been working on a virtual reality model in his garage. The military might be interested of course, but Michael’s interest lies more in the question of beauty—“Could beauty be taken apart… Would its data be synthesized, somehow, into a lifelike experience?” And how many different angles and points of view would one need to create that simulation? Then he sees real beauty and ugliness, life and death alongside the Pacific Coast Highway. The police are investigating of course, but the tale is told from Michael’s point of view, with beautiful scenery, complex mystery, fascinating art, and a touch of romance. The artist’s hand of the author is readily apparent in the character’s creations, both real and virtual. Suspicions grow. Reality intersects with the virtual. And a well-sculpted plot tells it all. A fast, fun and enticing read. From gripping first sentence to final resolution, Aaron Paul Lazar’s The Asylum is a mystery filled with warm characters and great sense of Maine coast locations. The story grows from the author’s mystery series, giving life to side characters in a very pleasing way as a young Mexican-American woman loses her job and starts to work at an… asylum. Of course, this is not the old-style asylum. Patients are treated and cared for here, in luxury and safety… But Carmen’s soon convinced there’s something hidden behind the scenes. Warm family life, honest emotions, great dialog, and some thoroughly scary scenes all add together to make an enticing mystery that feels like being invite to the home of friends. Sitting around the fire, comfortable with the assurance of good writing, which has to mean a good ending, learning what happened, how and why… it’s a dark cozy mystery or a warm dark mystery or… just a seriously good read. And a list of titles in the collection. Enjoy! "Besieged by threats and haunted by memories, can Alex and Jacob survive another fiery attack?" "The mission changed. Her cover is blown. With no where to run and nowhere to hide, what can she do to survive?" 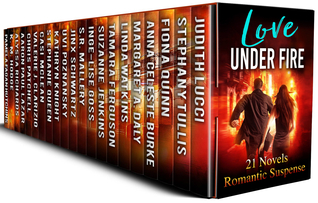 "Undercover, under fire, under arrest, it's hard to save a special agent's life while handcuffed." "When Lily returns home to California's wine country, sparks fly amid a hail of bullets as she and US Marshal Austin Jennings take cover. Who wants Lily dead?" "No one knows her secrets, not even her best friend. Can she keep her secrets and her monsters at bay long enough to give love a chance again?" "In 1685, a forbidden love catapults young Maude Prichard into a life fraught with danger...."
"Will Two Wounded Hearts Under Fire Survive LOVE?" "Moving horses to the high country comes just in time when Mindy and her coffee date witness murder at a Mojave Desert cafe." "When murder upends a diamond heist, can the jewel thief trust the mark who vows to protect her?" "When Lily sets up a spy trap, she faces great danger--of falling in love." "Michael creates a virtual reality simulation of the murder. Can he solve it in time, before the killer turns on the woman he loves?" "A dangerous ghost brings them together...but will they survive long enough to find happiness?" "Can this bad boy make a come back to save an old flame?" "Lies, Corruption, and Murder... exposing the truth leads to love--and a ghostly encounter. " "Can they overcome their painful pasts--and a murder investigation--to find happiness together?" "She's armed. He's dangerous. Together, can they stop a killer from tearing a small island community apart?" "Carmen has a secret, and his name is Dr. Micah Worthy." "Her husband's secret is priceless, her attempts to retrieve it could be deadly." "Susan Evenbright, pledges to make her last summer in Texas a killer one." "The last guy to call Maggie a buckle bunny didn't make his eight seconds."